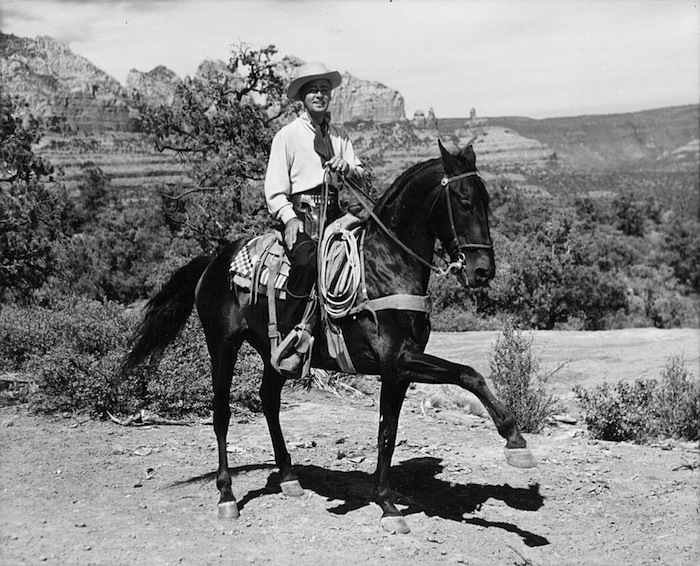 HUAC/The Blacklist | 50 Westerns From The 50s. The William Castle Blogathon: The Law Vs. Billy The Kid (1954). 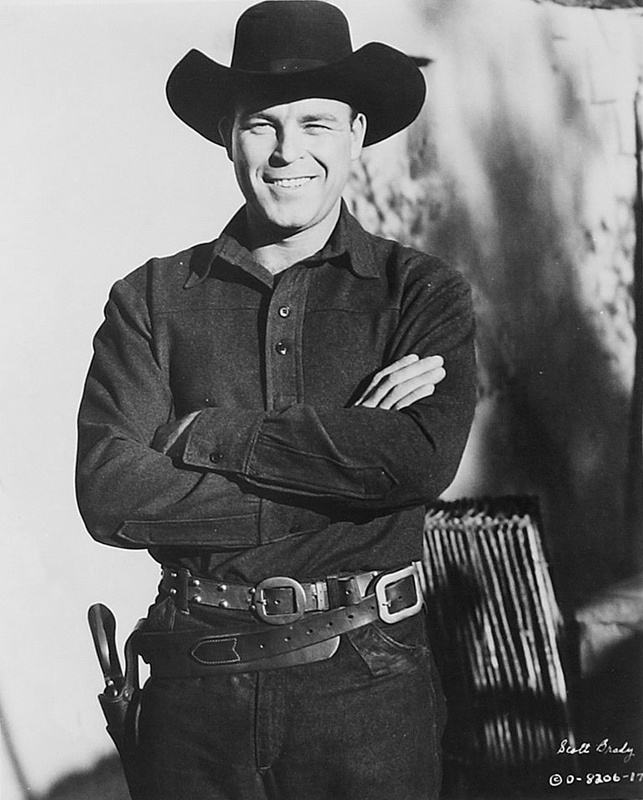 CAST: Scott Brady (Billy The Kid), Betta St. John (Nita Maxwell), James Griffith (Pat Garrett), Alan Hale Jr. (Bob Ollinger), Paul Cavanagh (John H. Tunstall), William ‘Bill’ Phillips (Charley Bowdre), Benny Rubin (Arnold Dodge). The William Castle Blogathon devotes a few days of online pontification to one of my favorite filmmakers. Castle was a huge part of my movie-geek childhood (one that I’m trying to pass on to my daughter). You’ll find other Castle posts here. 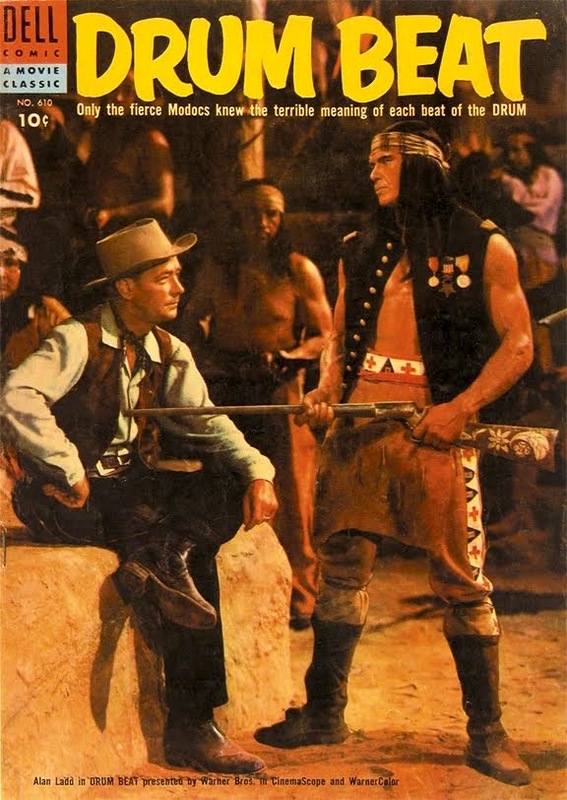 In 1954, Sam Katzman produced a series of Westerns about famous real-life outlaws and lawmen — Jesse James Vs. The Daltons (which was in 3D), The Law Vs. Billy The Kid and Masterson Of Kansas. All three were directed by William Castle, still a few years from finding his niche in gimmick-y horror movies aimed at kids, such as House On Haunted Hill (1958) and The Tingler (1959). The picture hits a few of the milestones of Billy The Kid’s life: his friendship with Pat Garrett, job with John Tunstall, involvement in the Lincoln County War, and his shooting by Pat Garrett. Those facts are as close as we get to actual biography. Here, the Kid (Scott Brady) is simply too old; Billy was only 21 when he was killed. There’s a cooked-up romantic subplot with Tunstall’s niece, played by Betta St. John. And as we’d see in Arthur Penn’s The Left-Handed Gun (1958), there’s an attempt to portray the Kid as a troubled young man forced into his life of crime. 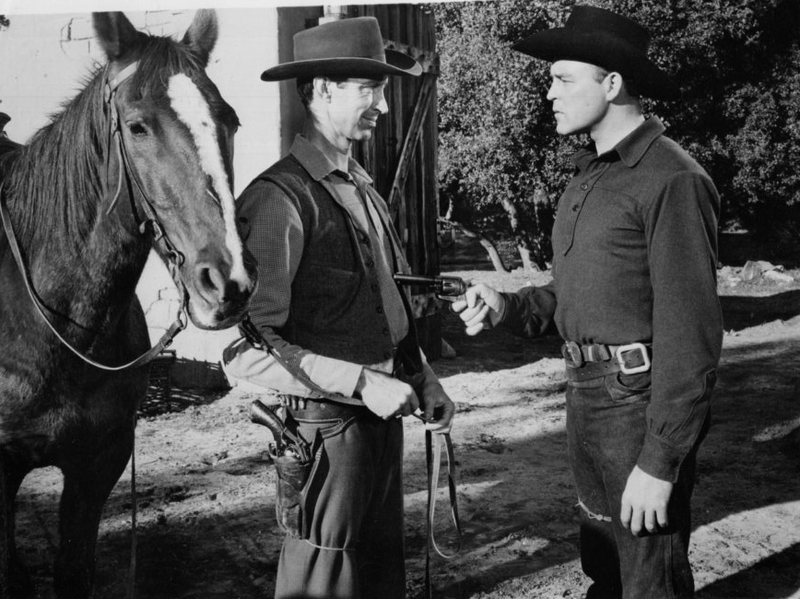 For a guy from Brooklyn, Scott Brady sure made a lot of Westerns, including his own TV series, Shotgun Slade (1959-61). 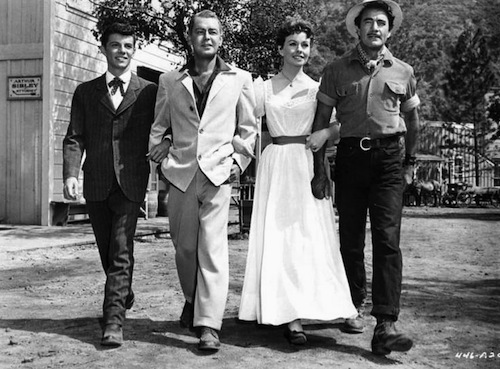 During the 50s, he worked with some of the genre’s best directors: Allan Dwan (The Restless Breed), Budd Boetticher (Bronco Buster), Joe Kane (The Maverick Queen) and Nicholas Ray (Johnny Guitar). 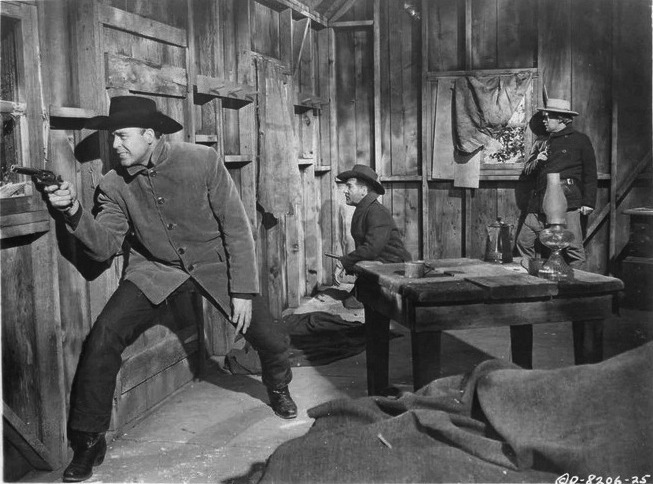 There were also a couple Regalscope Westerns, Blood Arrow and Ambush At Cimarron Pass (both 1958). 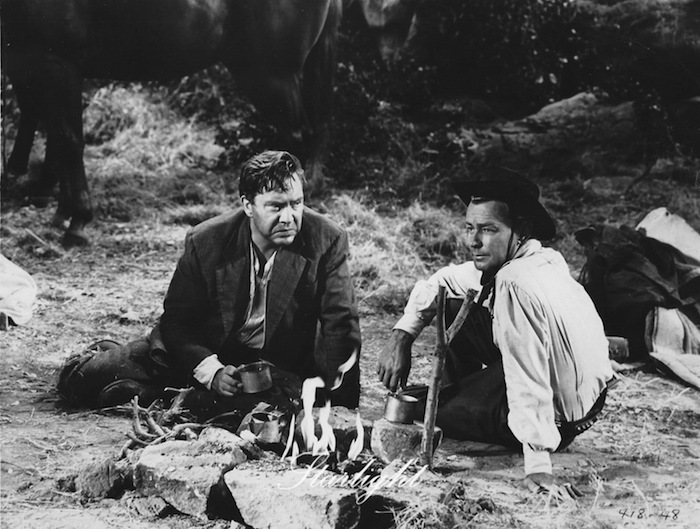 As Pat Garrett, James Griffith walks away with the film — just as he’d do as Doc Holliday in Masterson Of Kansas (1954). By underplaying, he gives Garrett plenty of strength. His performance really elevates the film. In his essential book Step Right Up! I’m Gonna Scare The Pants Off America, Castle didn’t devote much time to his Katzman Westerns, though he had nothing but praise for Katzman as a showman. By this time, Castle was a solid contract director — and he certainly knew his way around Hollywood locations like Melody Ranch and Walker Ranch. He wrote of this period of his career, “I was now on another treadmill, turning out a full-length feature every month.” He was still four years away from his independent breakthrough with Macabre (1958). Castle keeps The Law Vs. Billy The Kid moving at a good clip and gets pretty good performances from his cast. His direction is efficient and assured, even if he was cranking out pictures like sausages. There are no frills, no 3D, no floating skeleton, no Coward’s Corner. It doesn’t need them. 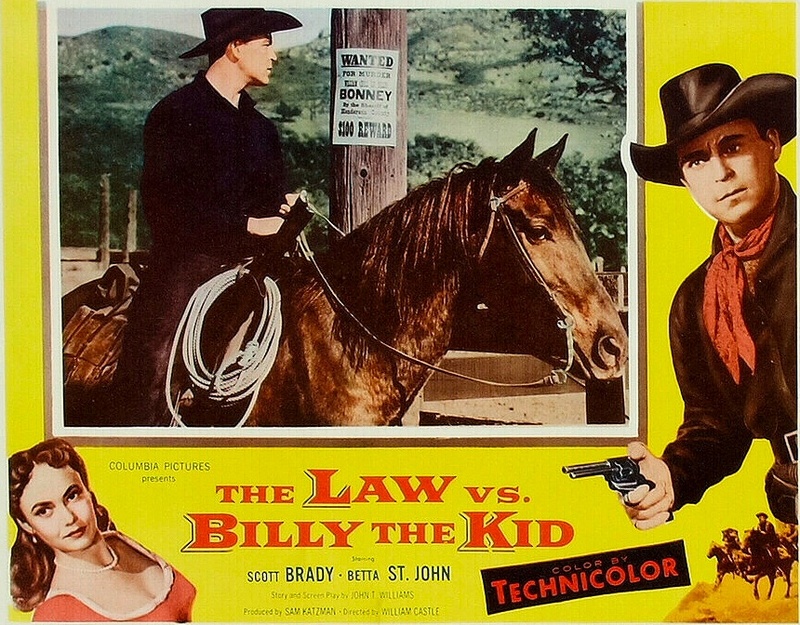 The Law Vs. Billy The Kid stands as another a good example of a middle-budget Columbia 50s Western. It was made fast and lean — remember, it was produced by Sam Katzman’s unit. But the pros, craftsmen and artists who made the film work wonders. One of these craftsmen would be Director of Photography Henry Freulich — who spent the bulk of his career at Columbia, shooting everything from Three Stooges shorts to The Durango Kid pictures to the Blondie movies to a slew of William Castle films. (He deserves a plaque here in the Roan house.) Freulich gives Castle’s Technicolor Westerns a bright, crisp look, and I really like the way he used the then-new 1.85 aspect ratio. * In 1997, the Writers Guild of America restored Bernard’s credit for The Law Vs. Billy The Kid.